RomanianFlowers.com - SEND FLOWERS TO ROMANIA! Don't forget to visit our gifts section as well! Love Roses - a wonderful lilies bouquet ! 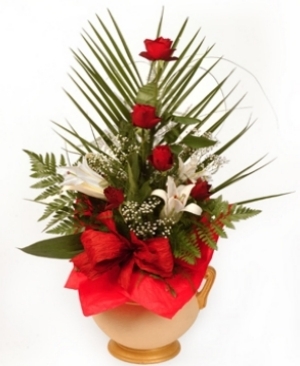 Elegant size: 5 Red Roses, 2 White Lilies, Gypshophila, Plumoza, Leather Leaf, Palm Leaf, Bear Grass. Medium size: 4 Red Roses, 1 White Lily, Gypshophila, Plumoza, Leather Leaf, Palm Leaf, Bear Grass. Small size: 2 Red Roses, 1 White Lily, Gypshophila, Plumoza, Leather Leaf, Palm Leaf, Bear Grass. www.romanianflowers.com is dedicated in providing you with a gift purchase that is of the highest quality and delivered on time. For us, your satisfaction is our top priority!